New foot pain and problems may be due to your insoles, not your shoes. It is common to develop new aches, pains, and foot problems when you get a new pair of insoles. Even if you are replacing a favorite arch support with one of the same model, you can feel some odd pains. The same is true if you bought magnetic or acupressure insoles in hopes of getting additional benefits. It can take some detective work to determine whether it is the shoes or the insoles that are at fault. Learn about symptoms you might have and what to do. It's best to only change either your shoes or your insoles, not both at once. Otherwise, it can be hard to determine which is producing new aches and pains. When you buy a new pair of shoes, put the old insoles into them until you are sure that the shoes work well for you. If you buy a new pair of insoles, wear them in your regular shoes for a few days to ensure they aren't causing any new discomfort. Don't take a new pair of insoles out for a long run or wear them for an all-day walking tour. Start with wearing them only for 15 minutes, then switch back to your old footwear. Build up this time steadily five or 10 minutes at a session. This gives your muscles and ligaments time to adjust. Ankle pain: The sides of your ankles can begin to hurt when you walk. This may feel like shin splints, but on the outside or inside of each ankle. Shin splints hurt on the front of your ankle, up as far as your knee. Arch pain: If your insoles are producing discomfort or pain in your arch, they may be providing too much or too little arch support. Blisters: You may suddenly develop tender "hot" spots or blisters on your toes, heels, or balls of your foot. The tops of your toes may become tender, especially at the base of each toenail. These problems might resolve themselves in a few days. But you shouldn't let them go on for any length of time. If you’re having any problems with new insoles, it's best to stop wearing them. Aches and pains can lead to an injury and blisters can lead to a skin infection. To reduce the expense, buy them from retailers with a generous return policy. In any case, it can be cheaper in the long run to absorb the loss rather than incur a medical bill. If you want to investigate whether the shoes or the insoles are causing your problems, you can take these steps. First, go back to your old shoes and insoles and see if you still are having problems. If your symptoms fade, it is a good chance that the new shoes and insoles are at fault. Even when buying the same model, there can be differences in manufacturing that made that pair less appropriate for you. The design may have changed since when you last bought them, or they may be coming from a different factory. Finally, you could just be noting the variation from pair to pair. If you've worn the insoles with a new pair of shoes, check the wear-pattern on the sole and compare it with your on your old pair of shoes. Any changes to your gait, which will reflect in the wear pattern, could be due to either the shoes themselves or to the insoles. To see which may be more at fault, wear your new shoes with your old insoles (or no insoles) and see if the problems persist. 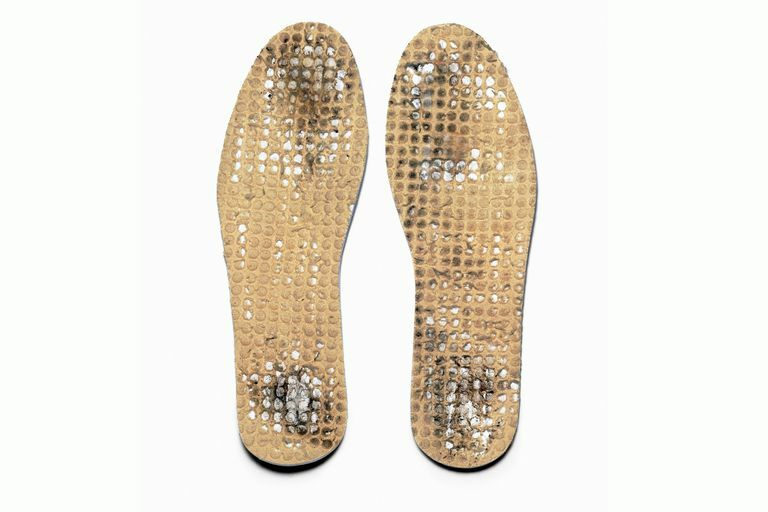 You can also try the new insoles in your old shoes and see which symptoms you experience. If you switched to a thicker arch support or one that runs the full length of the shoe, it might be too thick and too high. This could transfer your weight to the outsides of your feet, which could result in ankle pain. If you feel any discomfort from the arch support, it may be too high. The outside of your toes can then rub on your shoes because of the high arch padding. This can lead to tenderness, hot spots, and blisters. Insoles that are too thick can force your toes up against the top of the shoe, resulting in pain to the nail beds. This can even produce black toenails. Don't suffer with new insoles thinking you are going to break them in. Insoles should feel great from the first wearing, or they are not for you. Build up your wearing time gradually so your body adjust to them. But if you experience discomfort or pain every time, it's best to cut your losses. What Do Wear Patterns Mean for Your Walking Shoes? Can FootBalance Custom Molded Insoles Make a Difference?